Our popular kids parties are run by our lively and enthusiastic coaching team. The kids will play loads of sports, then into the clubhouse for prize ceremony and food. Parents are welcome to watch, join in or relax in the bar. Mini Tennis, fun and games. 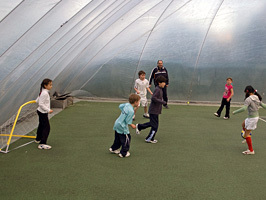 Mini Tennis, Football, Cricket, fun and games. All parties are led by our team of qualified coaches. Parties are held on weekends and during school holidays. We require 3 weeks notice for party bookings, a deposit of £30 is payable at time of booking. Maximum party size is 30 children, minimum size is 12. Party duration is 2 hours, 1 hour 20 minutes of party games followed by 40 minutes for eating outside (weather permitting) or in the clubhouse. We do not provide birthday cakes, please bring your own. Warm clothes (tracksuit) are needed on cooler days during warm up period. Please ensure you wear non marking shoes. Parents are welcome to use our clubhouse bar, food is available if organised in advance, please ask for details. Cost is £13.50 per child, including party menu. Selection of sandwiches, selection of crisps, sausage rolls, sausages, fruit selection (grapes, satsumas, apples), biscuits, fruit lollies, orange and blackcurrant squash. You are welcome to bring your own birthday cake. Adult snacks are available, pre-booking is essential. 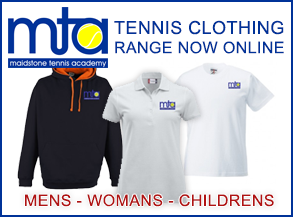 Tennis & Sports Parties are run at Freedom Fitness, Buckland Hill, Maidstone, Kent.